These part numbers below don't plug into gmpp, where are you guys getting these parts? for the windage tray, just Call GM, and tell then you need a vintage GM part... cost me $20 plus 5 shipping or something. Still cant locate the baffle bolt, and nut for brace..
Btw, the baffle is another name for the windage tray right? yah, for those bolts, just got get some bolts from a local hardware store. It is a common thread ( I got threaded rod and red loctited it into the block) and just some generic nuts. I think the reason for not being stickied is because this is only one mod, maybe if somebody wrote a full 2.4 build guide, with this included in it, it would get stickied. It would give a place for the 2.4 guys to add stuff as it goes along. Like the question that comes up almost as often as this one, the Crankcase Ventilation question when being turboed. It would become a how to in the library not a sticky. It is too bad that the person or persons responsible for doing this sort of thing are not taking care of things like this in a timely mannor. As you can see I have already voiced my concern about it in that thread. Also I wanted to thank all of you who have contributed to this. It has helped me alot. THANK YOU! Some one email me with what part numbers you want. I work for GM. BTW, I got 3 oil baffle trays for 17 bucks, VPI should sell direct too, they have a web site. Well I went to gmpartscheap.com and placed my order for the brace and windage tray. Two days later I got an email saying that the part is unavailable. So about the oil pan. 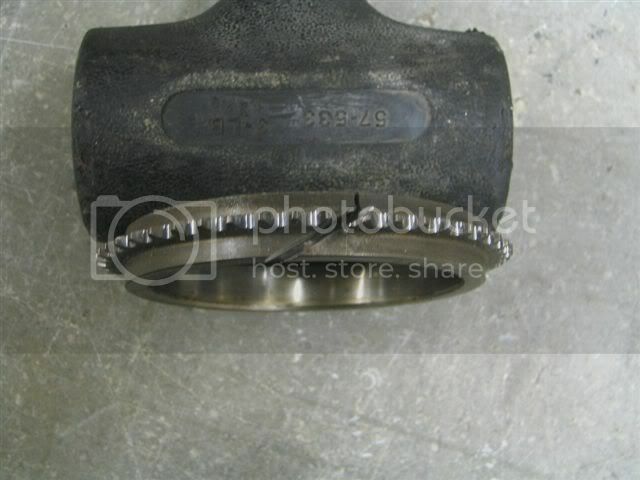 I have a friend who is a good welder and mentioned it would be easier to weld the 2.4l flange onto the 2.3L pan. Yes it's welding to cast aluminum but so is the extention to the 2.4L pan. What I'm wondering is, will the 2.3L pan be deep enough, why don't people do this and how would i figure out the proper amount of oil to put in? I am not sure why the 2.3 pan is not used. I do not have one to compare to my 2.4 oil pan so I do not know where they diifer. I do not know why your friend says it would be harder to modify the 2.4 pan. The place that did mine only charged me $150.00 I have pictures of mine if you need them however the pictures of the pan on the first page seem good enough to get the job done. He just said it would be more difficult than cutting the flange from one pan and putting it on the other. Taetsch Z24- Can you still get this through GM? Silly question, does this crank gear come with a gash in it? lol or is that something we have to do to it? Also, why is the windage trey marked with black marker? I believe the windage tray and the brace are available through Vintage Parts . No, the crank gear does not have a cut in it. It is all one piece, which is pressed on. The windage tray has black marker on it because that end of the windage tray needs to be pounded down a bit with a hammer to fit in the modified 2.4L oil pan. The 2.3L has the dipstick in the front of the motor. You would most likely have to bore a new hole and do more welding to use your stock 2.4L dipstick. "Youth in Asia"...I don't see anything wrong with that. BTW Whitecavy, if you have any questions feel free to e-mail me. I have all my photos saved from when I did the conversion. I also have a diagram that shows what needs to be plugged, tapped, etc. And on one post, I have all the sizes of taps, drill bits, everything listed and even shown in a picture. Thanks for the info guys,. Luke, Ill email ya asap. Im trying to get all my parts together before I pull the motor in October..
Welding a thin flange all the way around = much warpage. Also you would still have to build in the areas that don't match up. i think i better tell Speed Racer that he cant use the dip stick that he is using. The pan he got from Protomec works and LOOKS great!, he has truley masterd function and form. but ya'al no best right?! back to topic, yes i can still get everything... i have a box o parts wating for me to get time... messting with my GTZ and my wife's Z24.... but what ever anyone needs from GM let me know. i will give you cost + what ever it cost to ship. I don't follow what you are saying Chris. If Brian has a modified pan from Todd, it will be a modified 2.4L pan. Paul asked why we don't just use the 2.3L pan and adapt it to work with a 2.4L block. That is what I was explaining. Unless he were to use a 2.3L dipstick (which I'm not entirely sure is possible without a Quad4 block), he would need to have the 2.3L pan altered to accomidate the 2.4L dipstick/black dipstick tube. Because from what I remember, the tube goes into the LD9 block itself. If the Quad 4 is the same way, and you wanted to use the 2.3L dipstick/tube you would need to find a good way to seal and support the tube, since there are no provisions to support it on the front of the LD9 block. That's all I was saying. If you want to give me a total, and lemme know we'll work out payment details..
get the pump aftermarkit. GM wants like 250 for there's. Oh crap, ok.. Thanks Ill do that then..